If you liked the view of the Chrysler Building in my last post, you will probably like this photo's perspective. Or how about this photo of the Empire State Building rising above all the buildings on 34th Street? Or this view across the East River of the United Nations Headquarters Building? All of those views of the Manhattan skyline were taken from the New York City borough with the best panoramic views of all -- Brooklyn! The Williamsburg Bridge and the lower Manhattan skyline can also be seen in the distance from this ferry stop vantage point. The tall building under construction in the right of the photo above is the new World Trade Center One. New York Waterway's East River Ferry provides frequent, reliable service that connects Manhattan with various destinations in Brooklyn, Queens and Governor's Island. Prices at this time are as low as $4 for a one way ticket to $12 for an all day pass with hop-on hop-off access to all terminals. It's a wonderful way to travel and a unique way to see the city. I hope you hop on board the next time you visit! Many thanks to all the blog hosts! It has been raining quite a bit lately here in New York City. The dark gloomy days of winter have been unseasonably warm, and I'm thankful we have not been besieged with snow and ice instead, but the rain does nothing to lift my spirits, as I miss and mourn my Mother. To lift my spirits, my husband invited me to have dinner this week at our favorite Italian restaurant in Manhattan, I Trulli, which is located in the Flatiron Gramacy neighborhood. I took the express bus into Manhattan from Brooklyn and arriving little early I decided to walk around a bit. At One East 29th Street (Between Fifth Avenue and Madison Avenue) I came upon the Church of the Transfiguration, also known as "The Little Church Around the Corner." The church history is explained briefly on its website: "Founded in October 1848, The Church of the Transfiguration is one of the most famous Episcopal parishes in the United States. For more than 160 years, The Church of the Transfiguration has been known for its inclusivity – welcoming individuals from all races, classes, sexual orientations, and other backgrounds. 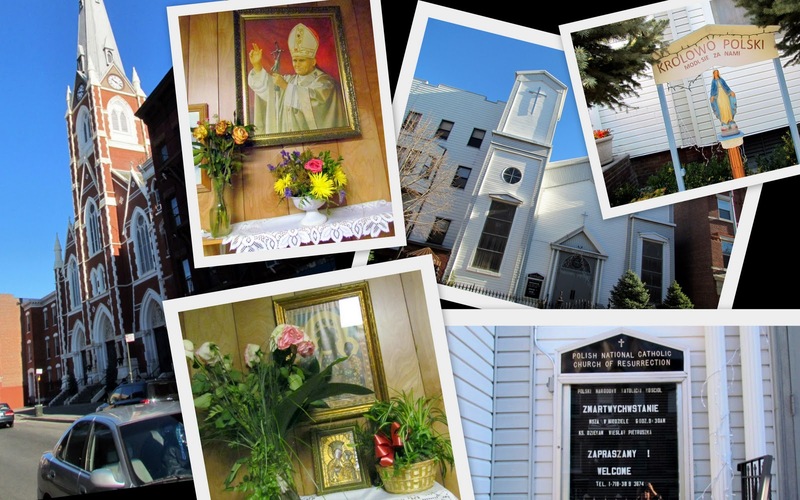 Established on what had been the outskirts of New York City in the mid-19th century, the church today is a visible worshipping community near the geographic center of Manhattan. The Church of the Transfiguration was founded by the Rev. George Hendric Houghton, sometimes called one of the Saints of the American Church, who served as its rector for 49 years. In his ministry to those in need, he sheltered escaped slaves as part of the Underground Railroad and African-American families during the Draft Riots of the Civil War and welcomed members of the theater profession, something not common at the time." "To this day, The Church of the Transfiguration maintains close ties to the theater. 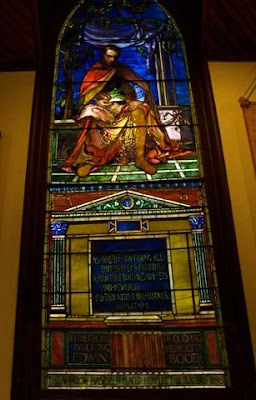 The church has served as the national headquarters of the Episcopal Actors' Guild since its founding in 1923, by the third Rector, Dr. Randolph Ray. The church itself was designated a United States Landmark for Church and Theater in 1973." Such theatrical greats as Basil Rathbone, Tallulah Bankhead, Peggy Wood, Joan Fontaine, Rex Harrison, Barnard Hughes, and Charlton Heston have served as officers or council members of the Episcopal Actors' Guild. The Little Church's association with the theatre continued in the 1970s, when it hosted the Joseph Jefferson Theatre Company, which gave starts to actors such as Armand Assante, Tom Hulce, and Rhea Perlman. The story of the church's nickname and its quiet little garden have attracted many couples from around the world who have chosen to be married here. I decided to stop in for a few moments to reflect and pray. Unfortunately, the main body of the church was closed and I had to take the photo above through the wavy glass window of the locked gate that was across the back of the Narthex. The smaller "Chapel of the Holy Family," also known as The Bride's Chapel," was open, however, and I sat there in peace for awhile. Thousands of marriages have taken place before this altar! I found this short Youtube video that shows more detail from inside the church, including the iconic Jefferson "Little Church Around the Corner" stained glass window. 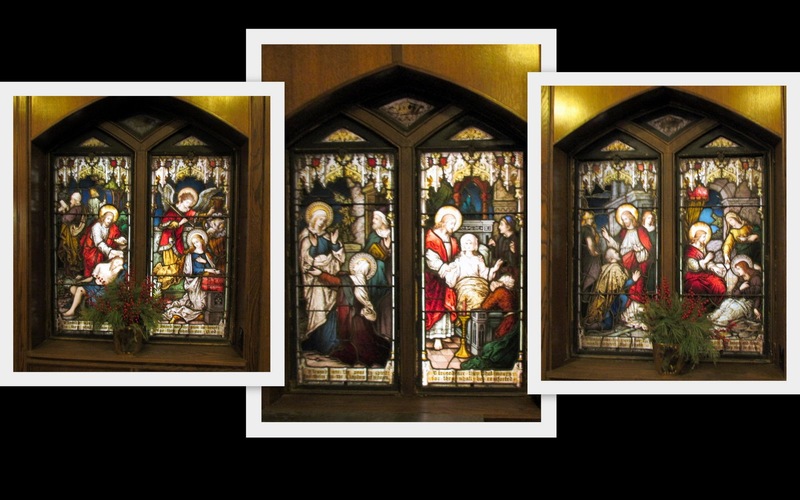 A photo collage of the stained glass windows in the Chapel of the Holy Family. The stained glass window in the Lady's Chapel. Once again outside I left through the church's unusual Lychgate. Mrs. Franklin Delano (nee Laura Astor), great aunt of President Franklin Delano Roosevelt, funded the construction of this gate in 1896. The gate is in need of repair and restoration, so the church has set up a fund to collect money to do both. If you are charmed by the story of "The Little Church Around the Corner" and wish to learn how to contribute to this fund, I'm sure you can contact the Church through their website. ...and waited for my husband at the subway stairs across from the Flatiron Building. We then walked a few blocks over to the restaurant on East 27th Street. Can you see the Chrysler building in the photo above? A closer view of the Chrysler Building's ornate top. ...as was the warm fire inside. I have to say the day brightened for me in many ways. There is peace to be found in many ways in New York City -- a quiet church, a lovely park, the uplifting vistas of landmark buildings, and a favorite cozy restaurant where we have shared many good memories, all helped me feel better. Where do you find the same experiences where you live? Where do you go to brighten your spirit? I'm adding this post to Spiritual Sunday, Scenic Sundays, Seasonal Sunday, Mellow Yellow Monday, Blue Monday, Mosaic Monday and Our World Tuesday. Many Thanks to the blog hosts! Greenpoint is the northern corner pocket neighborhood in the New York City borough of Brooklyn. Greenpoint is largely a working class neighborhood sometimes referred to as "Little Poland" due to its large population of working-class Polish immigrants, reportedly the second largest concentration in the United States after Chicago. You can see the skyscrapers of Manhattan in the distance, with the East River between, separating Brooklyn and Manhattan. In the early days of Brooklyn, Greenpoint was mainly farmland. Come the 19th century it became highly industrialized like most of North Brooklyn with a focus on shipbuilding, given its proximity to the water. 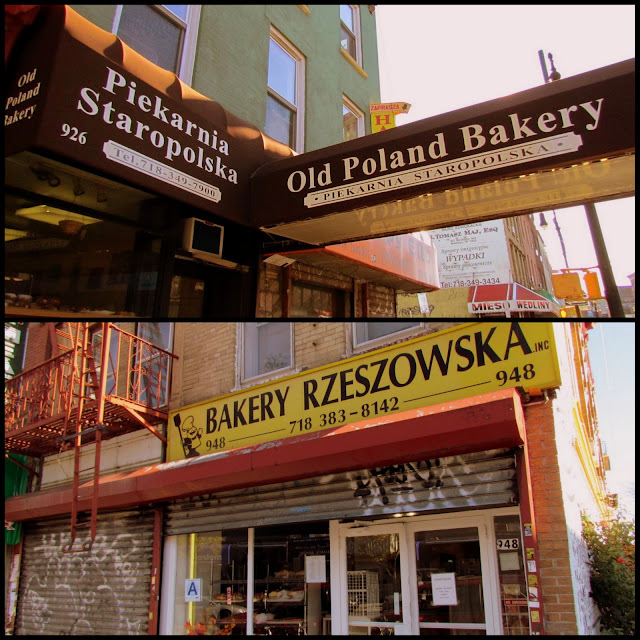 The Polish settled the area before the turn of the century and Greenpoint has been categorized as a predominantly Polish neighborhood ever since. There is a definite Polish feel to the neighborhood churches and buildings. To the left in the photo collage above is St. Anthony - St. Alphonse Catholic Church. Its Gothic Revival style has a strong presence on Manhattan Avenue. The Polish National Church of the Resurrection, on the right in the collage above, is located on Leonard Street. The shelves were filled with all kinds of Poland imported chocolates and wafer candies and cookies. 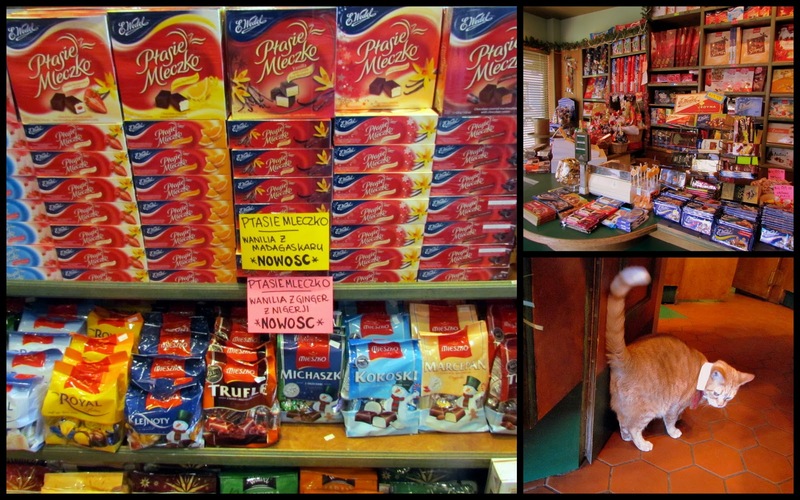 It even had a friendly, purring cat, who was all decked out in a shirt collar and tie. 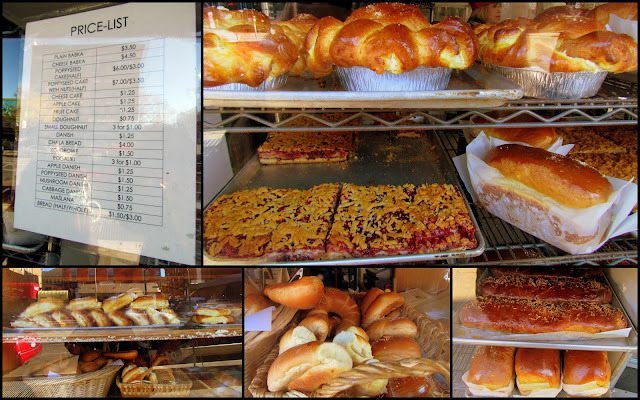 ....where I saw the most delicious babkas, breads, donuts and pastries. It took great self control for me to not buy a cheese babka as they looked so good! Perhaps I'll come back after my daughter's wedding, when I am not dieting any longer ... sigh. 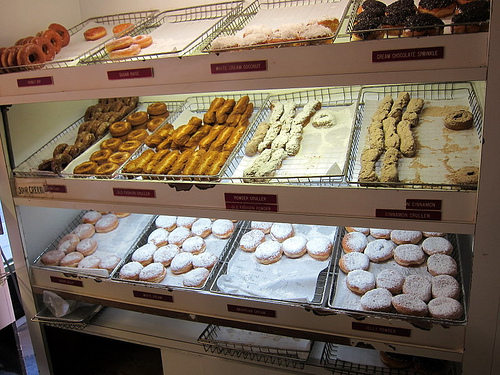 Another temptation were the fresh, daily made donuts at the Peter Pan Donut and Pastry Shop, located at 727 Manhattan Ave. in Greenpoint. They have such a large following of fans from all over Brooklyn that they often sell out all their delicious home made donuts quickly. The jelly donuts are especially good! ...the spicy, garlicky, salty, and sweet smells of kielbasi, sausage, and other cured meats immediately whiffs into your nostrils. It is a carnivores delight! 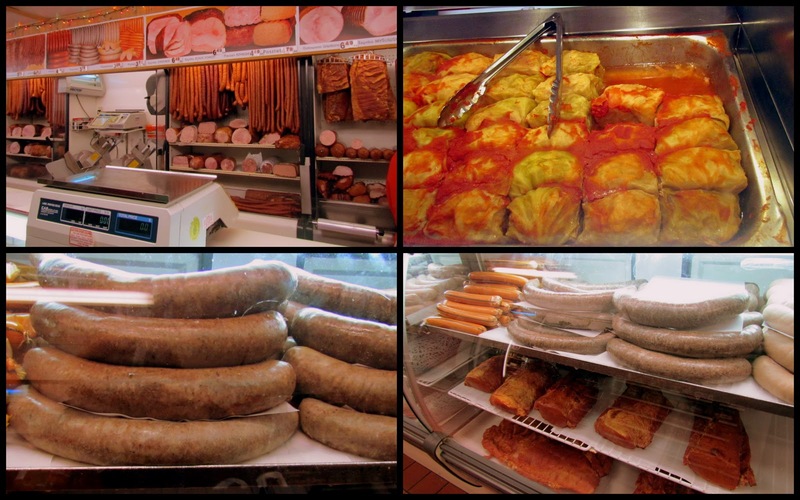 Just look at the size of those sausages! I was also tempted by the stuffed cabbage rolls that were for sale. Even the newsstands in Greenpoint are dominated by Polish and Eastern European magazines and newspapers. 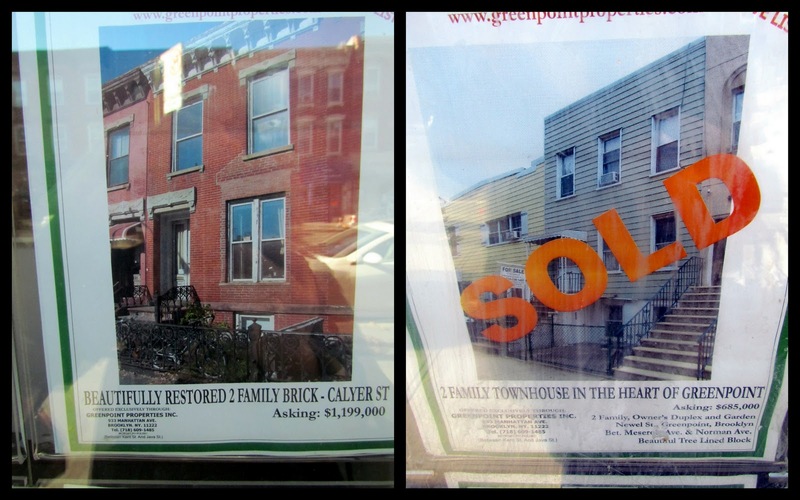 ... predominately plain, wood frame and brick multi family homes. That is not to say that real estate is cheap here, as you can see by this photo buildings for sale on a real estate office. Greenpoint Brooklyn is certainly a colorful place to visit! Many thanks to the blog hosts. Visiting Etsy Lab in Brooklyn, NY!